Evans is forgetting the lessons of the 1970s. What Evans is proposing is a change in the policy rule - a change in how the state of the economy maps into actions by the Fed. What economists understand today that they did not in 1975, is that commitment by the Fed to a policy rule is critical for its success in fulfilling its mandate. Once the public understands that the Fed intends to exploit a short-run Phillips curve relationship (and the problem is worse if the short-run inflation/unemployment tradeoff in fact does not exist), then all bets are off. High inflation can become well-entrenched and we have to go through an episode like the policy-induced "Volcker recession," followed by a long period where the Fed re-establishes its credibility. Although the wording of the Federal Reserve Act requires the Fed to care about both inflation and unemployment, as Williamson notes, its practice has evolved towards a de facto inflation targeting rule with an objective similar to the European Central Bank's "below, but close to 2%". This is evinced by all the mentions of the Fed's "comfort zone" as well as the "longer run" projections of 1.5-2% inflation from Fed board members and regional bank presidents. In terms of economic theory, it can be justified by the result, in some models, of "divine coincidence" - that policies which stabilize inflation also stabilize output. If the Fed heeded Evans' argument, it would be more willing to risk breaking its inflation target rule to reduce unemployment. In economic theory, one of the main points benefits of having a rule is that it lends "credibility" to monetary policy and "anchors" expectations (this speech by Charles Plosser is a nice intuitive exposition of the "time consistency" logic underlying this argument). But that only works if the central bank actually follows its rule. Hence Williamson's concern. Inflation targeting is relatively new - New Zealand was the first to adopt the practice in 1989, and it has since been implemented by the UK, Canada, and the European Central Bank, among others. Most of the countries that have adopted inflation targets have set them in the vicinity of 2%. Inflation targeting with a higher target would reduce the risk of hitting the "zero lower bound" on short-term interest rates. Price level targeting would require higher inflation to make up for periods of too-low inflation. Nominal GDP targeting is a re-incarnation of Milton Friedman's stable money growth rule, focusing on the right hand side of the identity MV = PY, which avoids the problem of unstable velocity (V), which doomed the early 1980's experiments with money growth rules. All three alternatives have been discussed over the past several years in commentary about policy and are good subjects for academic research, which may ultimately show that many of the world's central banks have adopted the wrong rule. Of course, the real problem with Evans' speech is that Ben Bernanke has no hair, so there is no reason for him to act like his hair is on fire. That may be why bald guys are so cool. [T]he chief reason why Greece cannot meet its deficit targets is because the EU has imposed the most violent fiscal deflation ever inflicted on a modern developed economy - 16pc of GDP of net tightening in three years - without offsetting monetary stimulus, debt relief, or devaluation. This has sent the economy into a self-feeding downward spiral, crushing tax revenues. The policy is obscurantist, a replay of the Gold Standard in 1931. It has self-evidently failed. As the Greek parliament said, the debt dynamic is "out of control". Last week, several events conspired to make the crisis more alarming. In Greece, the government faced lower GDP growth and higher budget deficits, making the task of hitting deficit targets appear more improbable than ever. Even though the Papandreou government has refused to throw in the towel and intends to close the latest budget gap by raising E2bn from a new property tax, there seems to be no conceivable escape from the familiar downward spiral – more budgetary tightening, low growth, higher budget deficits, higher bond yields. That leaves Germany with a clear choice, which is either to rescue Greece with a huge fiscal transfer or prepare to deal with the consequences of a Greek default, with a possible departure from the euro. To judge from today’s German newspapers, it is increasingly likely that they will choose to jettison Greece. Europe doesn’t have months, much less years, to resolve its crisis. At this point, it has only days to avert the worst. On Sunday, French government officials braced for possible ratings downgrades by Moody’s Investors Service of France’s three largest banks, BNP Paribas, Société Générale and Crédit Agricole, whose shares were among the biggest losers last week. The biggest banks in Europe, especially in France, hold billions of euros’ worth of Greek bonds, and investors fear even a partial default by Greece would sharply diminish the value of those assets, eroding already weak capital positions. American financial institutions, typically heavy lenders to their French counterparts, have begun to pull back on these loans, but United States banks’ exposure to France remains substantial. Update (9/12): A nice column today from Paul Krugman on the subject. The most straightforwardly effective components of the package for increasing aggregate demand are #2, #3, #4 and #6. Direct spending on school buildings (#3) and infrastructure (#4) increase the government purchases component of demand (and "Ricardian" or "crowding out" effects that would reduce the impact in some models are irrelevant now). Cutbacks by state and local governments have become a big drag on the economy - state and local governent employment has fallen by over 650,000 over the past three years. The funding for employing teachers and "public safety and first responder personnel" (#2) will put a brake on that trend. That is, it will be an increase in demand (again through the government purchases component) and employment relative to what would occur otherwise. Extending unemployment insurance (#6) is effective because much of the money goes to people who will spend it (i.e., people who are "credit constrained" from smoothing out their consumption over time). This increases the consumption component by raising disposable income. The release from the White House discusses some possible reforms to the unemployment insurance program as well - these are not detailed enough to evaluate, but possibly they might help mitigate one of the downsides of unemployment insurance, which is that it can reduce incentives to work (though I don't think that is a really significant contributor to unemployment now). There is more uncertainty about the effectiveness of the social security payroll tax components. Payroll taxes are the "contributions" paid equally by employers and employees (although employees only observe half of the tax through the "FICA" line on their pay stubs, in the long run, the burden of the entire tax - the "incidence" - largely falls on employees because their wages would be higher if employers did not have to make their contribution). The largest part of the act (#5) is a one-year reduction in the employee contribution to 3.1% - the standard contribution is 6.2%, but was temporarily cut to 4.2% for this year in the deal that was struck in late 2010. So, basically, this extends the existing cut, and adds another 1.1% to it. As with unemployment insurance, the effect of a tax cut in increasing consumption depends on whether it is spent. Households that are credit-constrained (living "paycheck to paycheck") are more likely to change their behavior. In this regard, it is less well targeted than the unemployment insurance extension, but it is superior to an overall income tax cut. Because the payroll tax is somewhat regressive, only applying to the first $106,800 of wages (and not at all to capital income), the benefits go largely to the "middle class." Although the primary desired effect is to increase consumption demand, even the parts of the tax cut that are not spent do have the benefit of helping improve the financial position of households. Large debt burdens are part of the reason recoveries from "balance sheet recessions" are typically slow, so if part of the tax cuts goes to pay down debt, that could serve to hasten the return to normal household spending behavior. The employer part of the payroll tax cut (#6) can be thought of as a positive "supply shock" lowering unit labor costs (in the short run, with lots of labor market slack, it won't lead them to raise wages). In a traditional Keynesian framework, this would shift out the aggregate supply curve (or, equivalently, shift down the Phillips curve). In a "New Keynesian" model, this is a reduction in the real marginal cost term in the New Keynesian Phillips Curve. Since the binding constraint on the economy is on the demand side, the usefulness of this part of the policy appears questionable. Indeed, reducing costs is deflationary, and deflation is a very bad thing. But it is a bad thing that the Fed is determined to prevent, and that is why this part of the package may have a positive effect. The Fed seems very averse to letting inflation become negative, but also very careful to try to keep it from going above 2% (in doing so, its placing too much weight on the "price stability" part of its mandate relative to the "maximum employment" part, as this justly-praised speech by Chicago Fed President Charles Evans argued). By putting downward pressure on costs, and therefore prices and inflation, the employer-side tax cuts may create more space for the Fed to act more aggressively. An important part of the proposal is still to come - President Obama said that he would deliver plans to "pay for" the jobs act (i.e., offsetting tax and spending changes, presumably within the standard 10-year window customarily used to assess budget proposals). This may be politically necessary, but, as I argued recently, there is no economic urgency for doing this, and I worry that political gridlock over paying for the bill could derail taking action now, which is urgent. Its also worth noting that, while the exact timing of some of the provisions is unclear, it looks like most of the effect occurs in 2012. That's a good thing, but even under the optimistic assumptions that something like this bill is enacted, and the Fed finds a will and a way to take more effective action, the economy is in a very deep hole and unemployment will still be elevated at the end of 2012. The expiration of the tax cuts puts in place an automatic fiscal contraction for 2013 (this is where the idea of "state contingent" policies would help, but would raise the headline cost, which is politically unpalatable right now). Private-sector estimates suggest the bill would have a significant impact: Macroeconomic Advisors says it will raise GDP by 1.3% and increase employment by 1.3 million next year; Moody's economy.com (via Brad Plumer) puts it at 2% of GDP and 1.9 million jobs. See also: Gavyn Davies, Paul Krugman, Ezra Klein, Mark Thoma. 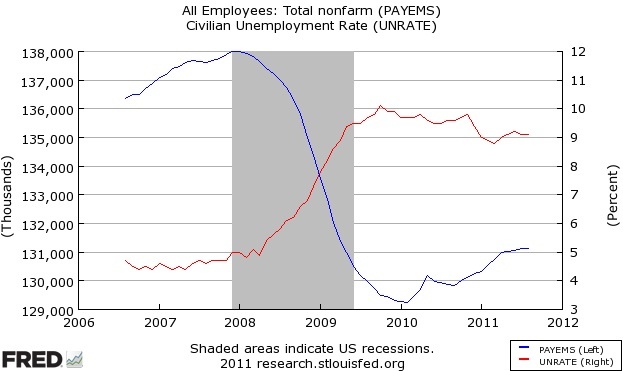 The BLS employment report for August is not a good one. Total employment was unchanged - i.e., no net jobs were added - which is really losing ground because about 130,000-ish jobs need to be added each month just to keep up with population growth and technological progress. Government continues to be a drag - government employment dropped by 17,000, and this would have been worse without 22,000 workers returning to work after the Minnesota shutdown. The Verizon strike also had an effect, reducing payrolls by about 45,000. That is, without the Verizon strike, there would have been a gain in private-sector payrolls of 62,000, which isn't particularly good. Also, the employment growth for June and July were revised downward. The payroll employment number is calculated from a survey of employers. 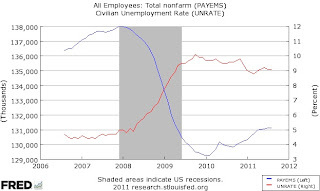 The unemployment rate comes from a survey of households. Overall, the household survey looks a little better (though it is considered less reliable because it has a smaller sample). The unemployment rate held steady at 9.1% and the number of people employed rose by 331,000. The labor force participation rate and employment-population ratio also ticked up slightly. Overall, this report should help convince the Federal Open Market Committee to take more steps in the direction of "easing" policy, and add urgency to further fiscal policy action to try to stimulate job growth. On a non-seasonally adjusted basis, payrolls increased by 118,000 (i.e., August is a month that normally has a slight gain, which is removed by the seasonal adjustment). Non-seasonally adjusted unemployment was also 9.1% (but down from 9.3% in July).